Made of elegant navy blue velvet, this challah cover incorporates the Shabbat and The Holy Land of Israel theme with the Guardian of Israel. The challah cover has then unique Jerusalem structures blended in with hills on multiple levels. The Hebrew word “Shabbat” is embroidered in the center. The whole image is framed with double lines, with motifs at each corner. 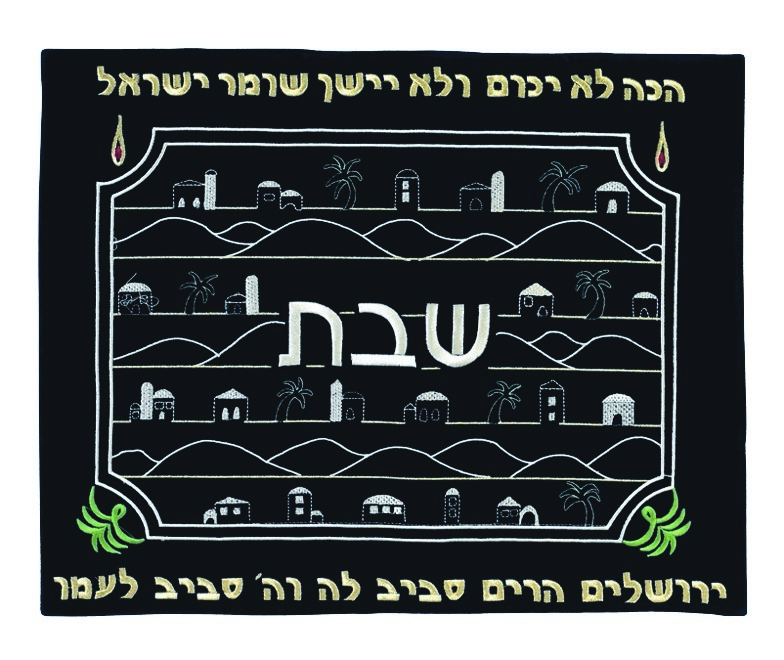 Above the design, the Hebrew verse from Psalms “Hennei lo yamun v’lo yeeshan, shomer Yisrael”, which translates, “For he does not res nor sleep, watching the Jewish nation”, is embroidered. On the bottom of the image, another Hebrew verse from Psalms is embroidered, “Yerushalayim harim saviv lah, v’Hashem saviv li’amoh”, which translates, “Jerusalem has hills surrounding it, and God surrounds His nation”.